See the panic that had blown at the end of 2008, when Pinnacle wanted to abandon Smartsound, I saw that we were a lot to change our avatars to proclaim "I love SmartSound". I am one of the fans of SmartSound for a long time but the price of singles or albums had clearly put me off considering that the bill was a bit too high. And then I discovered packs purchases that were becoming interesting. The SmartSound site had sales and downloading conditions not clear enough for my liking. So I slowed down because of the still high prices despite packs purchases but also by lack of clarity of their packs selling system. And then, I received a promotional email, on the occasion of a show, SmartSound was offering an additional 20% discount on the price of packs albums. Then, I gave in to temptation and I asked further explanations to SmartSound before ordering. I thought a little tutorial would not hurt you to take advantage of my experience of packs purchase at SmartSound. The first essential step is to create an account. From your browser, open the SmartSound's homepage . Click the "Create An Account" link. After providing your first and last name, email and create a password, you will immediately receive a confirmation email. You must click the link in this email to complete the creation of your account. From the "Royal Free Music" tab you can access all the tracks and albums all sorted according to various criteria. You can search from a category, a track or album or even a simple keyword. You can also view an entire category (Action, Blues, Background, Classical...). You can click on the link "(You are in TRACK VIEW. Switch to ALBUM VIEW)" to toggle the display of singles to albums or vice versa. The "ADD" button will serve later to buy a single or an album and fill your cart. The "MEDLEY" button allows you to listen before you buy. But to discover the discounts, you need to click on the "PRICING" tab. the latest singles and albums with discount. Here is a close up of an albums pack. Some explanations are needed. Prices are in U.S. dollars, representing a discount of 72% in this example. You buy a coupon that lets you choose 25 albums in this case. "One Year To Redeem" means that you have one year from the purchase date of your pack to choose albums that enter into the composition of your pack. The duration varies with the importance of pack. You can choose from the entire library including the latest novelties. Your license is purchased once and for all. You can proceed after coupon purchase of singles or albums download you come to select. At the end of the order of each single or album, you can buy the physical CD for an extra cost. If you have a good management of your files and your backups, you can save ... Especially at any time, you can always re-download your albums from your account. A click on the "ADD" button begins to fill your cart ... For the credit card I let you alone... you're guided. When you come to the end of the formalities to purchase the coupon you receive a confirmation email of your purchase immediately with all the information necessary to download and install albums. The "My orders & tab coupons " tab of your account will reflect the purchase of the pack. By clicking on the link "Order Details" you can see the list of your choosen albums growing. The link "Wiew Recept" allows you to control what you already have and the number of albums you have to choose within the limits of the number of albums in the pack. The expiry date of the coupon is recalled. Your selections must be completed before this date. You can view the singles or albums by filtering (Current filter "countryfolk"). Albums you have already selected are marked with a "Customize" button. Albums you have not yet selected include the "ADD" button and the dollar price. The double-arrow button provides access to all tracks in the album. You can listen it and modify the parameters. When you select an album, it is charged up to $ 0.00 as long as you are within the limit of the number of albums of coupon you bought. the "My Music" tab allows you to view your selections. It's from these links you can eg download your selections in different forms. You can access your downloads from different pages of your account. For example, here, from the "MY ORDERS & tab COUPONS " tab. The link "Download SSDL" enables download. A pre-download window opens and you must wait. The link "Order details" displays the albums that you've already selected. The link "Download SSDL" corresponding to the selected album allows downloading. After a few seconds, the pre-download window expands, the "Download" button appears in the upper right corner and download is possible. 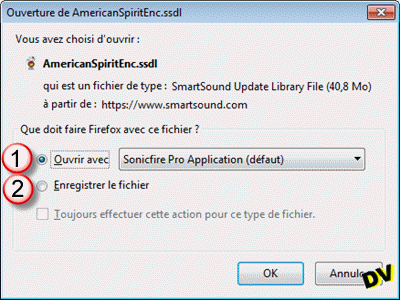 Open the file with "Sonicfire Pro Application" (which implies that the Trial Version - used with Studio plugin - is installed on your computer). The file will then be downloaded and installed. Save the file. The file will be simply saved on your computer without being installed. If you have decided to avoid physical CD, I suggest you use the option to save the file. Then just double-click on the *. Ssdl to install and you will avoid a double download. At the end of the download (or when you double-click a file ssdl *.) Sonicfire Pro opens and displays a window control license. It is in this window that you have to fill in the four fields with the four infos you got previously. Do not forget to modify the first field that appears by default with the date and not the date of the coupon purchase. Do not forget to check the box marked 5 in which you certify that you are the holder of the license and you are legally allowed to install. At this point only the "Submit" button becomes active and the installation begins after checking license. As long as Sonicfire Pro is open, you can install multiple albums without the appearance of a new control window license for each album. 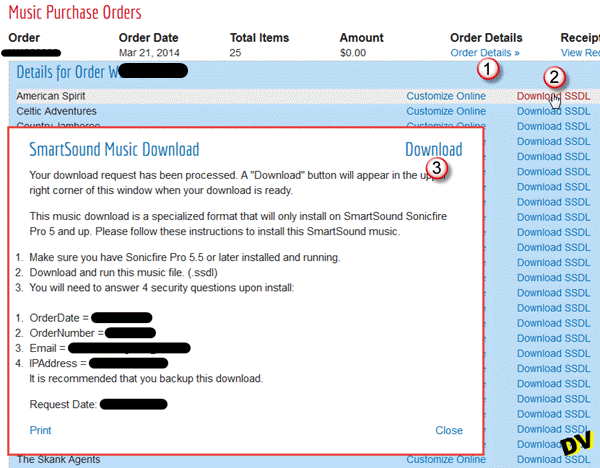 So yes, SmartSound are expensive but it is not illegal to be smart and wait for discounts to enjoy. To remain informed, the SmartSound newsletter regularly informs you of the release of new albums and discounts (on average two mailings per month).